Facebook announced a new type of ad unit, slideshow, that it says will help businesses reach users in emerging markets and will be available to advertisers globally. The tool is a simple one, using Facebook’s ad creation tool marketers can either upload several of their own images or just choose from stock images provided by Facebook. 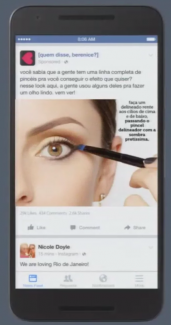 Facebook converts the images into a short video that will play automatically when it appears in the news feed. There’s no additional cost to advertisers to use this type of ad and it’s delivered programmatically just like other ads of Facebook. The new “slideshow” ad works well in place of larger video ads when targeting users in emerging markets, Facebook’s team made clear in a media roundtable event that was webcast on Thursday. It was the exclamation mark in a presentation that covered Facebook’s efforts to provide a good experience to users on feature phones connected with a 2G network – a description that matches many in emerging markets such as India. “Each year we look out and see who’s on the border of being able to use this service, but we’re just not delivering the right set of tools for them,” said Chris Cox, chief product officer at Facebook. Facebook has an engineering team based in London that is focused on making the social network a useable product for those using slower, less reliable connections. It’s found small improvements like loading the news feed in increments, and pre-loading the content below the viewable part of the screen can help. 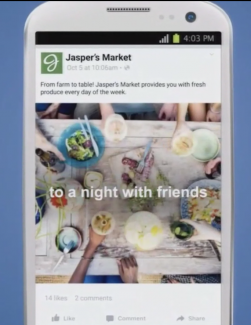 Some Facebook advertisers have already had an opportunity to put the new ad unit to work. Dettol Indonesia delivered two different campaigns – one featured a video that was played for users with 4G LTE connections, but a slideshow for those with 2G connections. Coca-Cola used it to reach 2 million users in Kenya and Nigeria with a TV show trailer. Netflix has used it to introduce new characters on its original content, and a makeup brand is giving tutorials on applying eyeliner. The new ad type is available on Facebook starting today. Expect to see new features added to it in the near future.